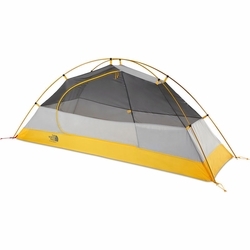 The North Face Stormbreak 1 Tent. The North Face's classic, easy-to-pitch, one-person camping tent for you, your pack and your dog is redesigned for spring with a new vestibule that makes camping even in adverse weather more enjoyable. A larger door allows for easier access, and provides an even better view of the great outdoors.